This client was remodeling their 25-year-old home and had to replace the original concrete roof because it was failing. The resultant leaks had proven impossible to locate and repair. They wanted a new roof that would be energy efficient, beautiful to behold, distinctive and suitable for their newly upgraded exterior. The ideal material? 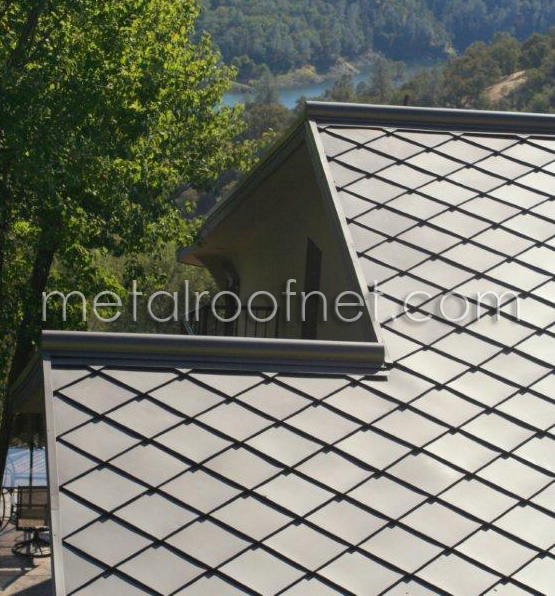 Our MRN diamond shingle in finished steel, installed over our MRN thermal liner. They also chose a custom-designed ridge cap "crown" that adds an element rarely seen in North America, but is well-know on high-end homes and buildings in Europe. The combination created exactly what they intended: a striking, energy-efficient roofing system that is also a small fraction of the weight of the original tiles. On top of that, this new system will out last the original concrete tiles many times over - and look even better doing it! Check out more images of this beautiful northern California project in our diamond shingle gallery. Questions about how to get a roof like this? Call or click today!